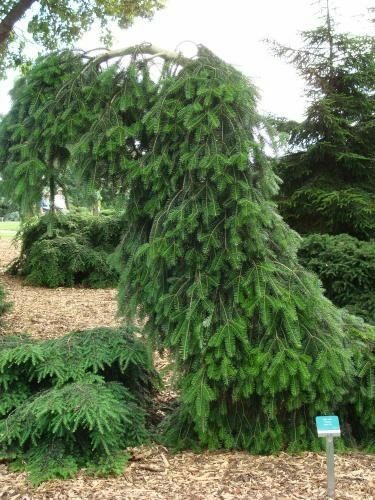 Abies alba 'Pendula' is often seen as a floppy little dwarf conifer, but given time, will overcome any juvenile gawkiness and attain a large size, creating an impressive narrow spire with a fountain-like effect in the landscape. This cultivar is a graceful, strongly-weeping, narrowly-columnar tree that requires staking. From the point of the highest stake, the tree will "knuckle over" toward earth, establishing its maximum potential height. The branches droop vertically, parallel to the stem. The needles are a nice green color, growing on strong shoots and are often recurved. Be aware that in spring, in some growing regions, young shoots can be damaged by late frosts. Typical growth rate in most climates is 1 foot annually, producing a large weeping specimen, 8 feet tall by 4 feet wide (2.5 x 1.2 m) after ten years . Abies alba 'Pendula' courtesy of the Rich's Foxwillow Pines online catalog.